Alright, so as you might know, one of the boss battles you’ll be dealing with in the desert is the return of Marino, who wants a second shot at beating you up! This time around, he’s leveled up and uses some crazy clone action to make this battle even harder. We have multiple patterns like this, which will become more and more difficult as the fight progresses. Of course, there’s a lot of placeholder graphics here, but the overall idea is the same: there will be some sort of visual indicator for where Marino and his clones will move next, which fades away once they make that move. 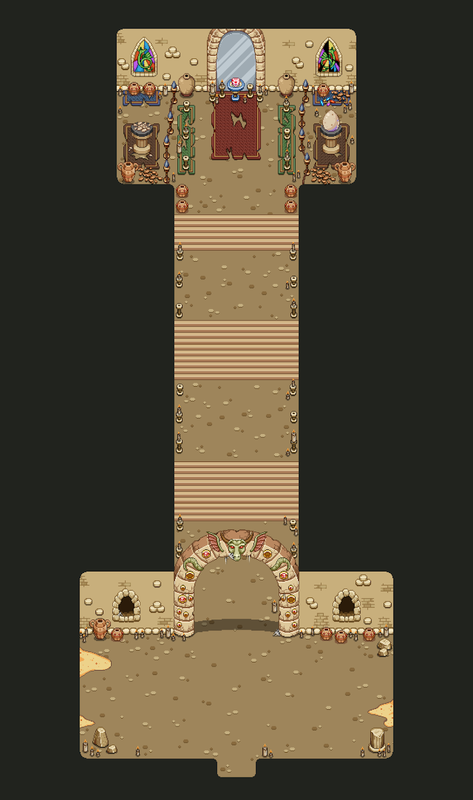 Now, time to continue working on the second room in those desert ruins! As mentioned before, it’s time to start working on the top part of this map, where some forgotten, ancient treasures will be…. Posted by Secrets of Grindea at 2018/08/13. Tags: boss, Enemies, gif, Portraits, Weekly Recap.